There are some days I wonder if anyone is listening. Some days I wonder if we are making any impact whatsoever in the industry. Sure we get thanked by readers, PR contacts, and sometimes even those who worked on the games. Yet there are times I see the same problems repeated over and over again. Or suggestions we make are not implemented. This is not one of those times. In fact this is one of those times that someone was paying attention. Someone followed our suggestion and went with it. Super Little Acorns 3D Turbo is a Nintendo 3DS game that we suggested. This game came from Little Acorns which was originally released on the iOS platform. The lack of physical controls hurt the iOS version of this game. Visually Super Little Acorns 3D Turbo looks similar to the iOS version. There is one major exception - 3D. The 3D enhances this game in some really neat visual ways. It also makes this little game look better in my ever so humble opinion. We do jump on enemies and make them leave the screen. No blood, or gore though. Sort of like Mario games. The music continues to be great in Super Little Acorns 3D Turbo. Even the pop sound when we jump on an enemy. The time concept is back. We have to collect all the acorns in a level to open a door. Then we can collect some fruit, or leave the level by going to the exit door. Super Little Acorns 3D Turbo comes with a whole slew of unlockable costumes, achievements and more. 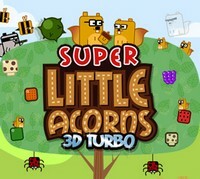 There are now ninety levels in Super Little Acorns 3D Turbo. They added thirty new levels, along with some new modes. So even if you conquered Little Acorns on the iOS there are reasons to play Super Little Acorns 3D Turbo on the 3DS. I had a lot of fun playing Super Little Acorns 3D Turbo. The swinging, jumping, and collecting action is a blast. There are multiple different things that can be done in levels. Collect all the fruit, dispose of all the enemies, and get through with a faster time. Taking hits slows you down which is a neat game play mechanic. I hope Super Little Acorns 3D Turbo is the start of a trend. There are plenty of really good apps that would be better on the Nintendo 3DS and/or PS Vita. Hopefully they will be given the same treatment in the coming months and years.